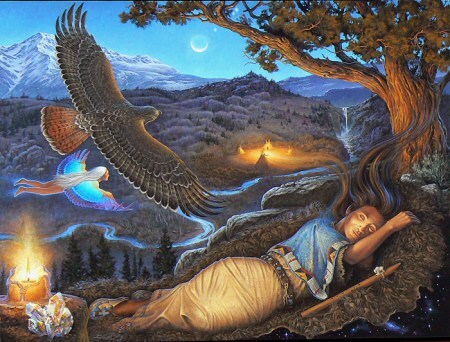 Shamanic healing can be used to remove negative energy and entities from houses, buildings and land. There are many reasons for wanting an house/land energetic cleansing, such as before moving into a house, you might detect the presence of entities/ghosts or bad energy from the activities of the former occupants. Or perhaps your current home has become filled with negative energy caused by everyday stress or relationship problems that have built up to an intolerable level. Burning white sage (not the kind you find in a spice rack) is a great way to remove the negative energy from a house. If that doesn’t work, you may consider having a shamanic house/land energetic cleansing. Below is an example of a house energetic cleansing performed by Shaman Elizabeth Herrera. I remember once when my husband and I were considering the purchase and restoration of an historic house in St. Petersburg, Florida, that had most recently been used as a senior living home. As we walked through the interior, a very uncomfortable feeling came over me, but I tried to stay analytical to estimate the restoration costs. Besides being in disrepair and gloomy, dark shadows seemed to dart across the hallways and through the rooms. After a hurried inspection, I couldn’t take it anymore and left—quickly! It’s understandable why people are afraid of ghosts or negative energy in their homes. It can be uncomfortable and sometimes scary, but a healing gave me a new insight into ghosts. One day, I received a call from a woman asking me to perform a house depossession. For many years she had owned a rental house that was haunted by a ghost who appeared as a friendly, older woman. The tenants hadn’t minded her presence and would often kindly refer to her. Then a new tenant moved in and the ghost made him uncomfortable. The tenant tried to ignore the ghost, but she grew bolder. One night, the ghost entered his bedroom, walked up to his bed, and told him, “Scoot over.” That was too much for him! The man slept on the couch that night and in the morning told the landlord he was moving out. The landlord wanted to know if I could perform the house depossession that day, because she didn’t want to lose the tenant, and if I could do it remotely since she lived in Utah. I answered yes to both questions, and later that day, I met the “ghost of the house”. The ghost was an elderly woman who was waiting for me with her “ghost” bags packed. The ghost said she knew the tenant and landlord didn’t want her in the house and was ready to move on. The ghost recalled living there with her husband and raising their children, who were now grown and had children of their own. Her recollection of fond memories made me see her as a “person” instead of a ghost…a person without a body. But her plans were to move into another house! I told her that wasn’t in anyone’s best interest. In order to continue her soul’s journey, it was important for her to move to the next realm. Without a body, she wasn’t experiencing the life lessons that were necessary for her soul’s growth. After she left, I shamanic journeyed to the spirit realm to meet with my spirit guide to confirm that she was gone. When I arrived, the ghost was sitting next to my spirit guide waiting for me. (It seemed that she was always one step ahead of me.) Everyone agreed, including her, that she had crossed over into the next realm, and then the angels took her away. My spirit guide then recommended that angels go to the house to remove the residual energy, so that the tenant wouldn’t sense the ghost’s presence any longer. I watched the angels descend into the house and cleanse the negative energy. Afterward, they infused positive energy by symbolically dropping flower petals. I knew it was a powerful healing when not only the landlord called to thank me, but the tenant did as well. The tenant said the most powerful aspect of the whole situation was the feeling he had when entering the house. He had expected the negative energy to permeate the house, but instead, he walked into positive energy that was so intense, he felt a natural high all day long. The healing affected the landlord, the tenant (who ordered several more healings for himself and family members), and the ghost. It shows how we are connected—whether we have a body or not.